SS-Brigadeführer was an SS rank that was used in Nazi Germany between the years of 1932 and 1945. Brigadeführer was also an SA rank after briefly being known as Untergruppenführer in late 1929 and 1930. The rank was first created due to an expansion of the SS and assigned to those officers in command of SS-Brigaden. In 1933, the SS-Brigaden were changed in name to SS-Abschnitte; however, the rank of Brigadeführer remained the same. 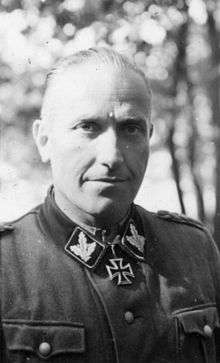 Originally, Brigadeführer was considered the second general officer rank of the SS and ranked between Oberführer and Gruppenführer. This changed with the rise of the Waffen-SS and the Ordnungspolizei. In both of those organizations, Brigadeführer was the equivalent to a Generalmajor and ranked above an Oberst in the German Wehrmacht or police. The rank of Generalmajor was the equivalent of brigadier general, a one-star general in the US Army. The insignia for Brigadeführer was at first two oak leaves and a silver pip, however was changed in April 1942 to a three oak leaf design after the creation of the rank SS-Oberst-Gruppenführer. Brigadeführer in the Waffen-SS or police also wore the shoulder insignia of a Generalmajor and were referred to as such after their SS rank (e.g. SS-Brigadeführer und Generalmajor der Waffen-SS und Polizei). ↑ McNab 2009, pp. 29, 30. ↑ McNab (II) 2009, p. 15. ↑ McNab 2009, p. 29. 1 2 Flaherty 2004, p. 148. ↑ Stein 1984, pp. 297, 298 chart, 300 chart. McNab (II), Chris (2009). The Third Reich. Amber Books Ltd. ISBN 978-1-906626-51-8. Stein, George (1984) . The Waffen-SS: Hitler's Elite Guard at War 1939–1945. Cornell University Press. ISBN 0-8014-9275-0. Yerger, Mark C. (1997). Allgemeine-SS: The Commands, Units and Leaders of the General SS. Schiffer Publishing Ltd. ISBN 0-7643-0145-4.